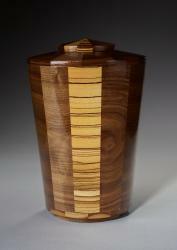 The Truth cremation urn is created by hand assembling and turning pieces of maple and black walnut wood. Our end result is a striking mix of brown and tan shades that gives off the feeling of intelligence and sophistication. 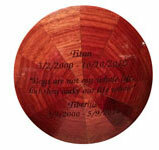 This artistic urn is available in small and large sizes for children, beloved pet companions, and adults. 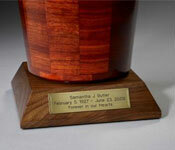 Keepsake Truth urns are also available to share the ashes of a loved one. Urn jewelry available at Etsy Charmed Wife Shop. I first learned of Steve via an article in the Tribune. I kept it noting that I would want something special for my beloved Chesapeake Bay Retriever, Rigr. He has not passed yet, but he is nearing 14 years of age in January. He has good and bad days and I wanted to be ready. 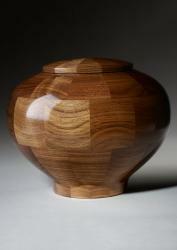 I ordered the Eternal Truth Urn, and am beyond happy. It is store away for now but will be displayed on a small display table when the times comes where I can see my pet all of the time. 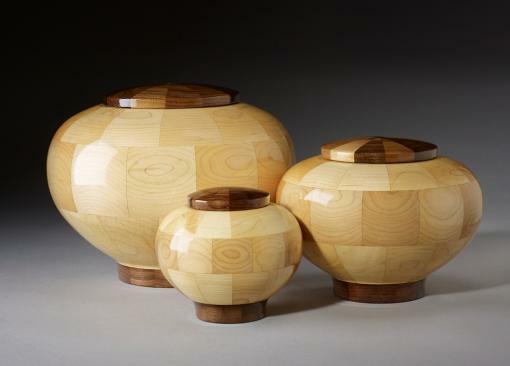 Steve's works are so beautiful that you don't think you are looking at an urn. I am recommending his work to people left and right, even my mom when the time comes. Thanks for your beautiful craftsmanship! Our urn is a real treasure. The engraving is perfect and you worked with us to ensure it. Thank you so much for giving us a piece that we will always love.